It should come as no surprise to anyone that Thanksgiving is without question my favorite holiday. Of course it’s all about those once-a-year flavors: roast turkey, stuffing, mashed potatoes… But what I really love is that it brings people together. It sounds cliche, but it’s true. This will be my fourth year of hosting my own thanksgiving. Every year I open the door to friends old and new, inviting many people, and winding up with a fantastic gathering full of food and camaraderie all in my little apartment. It’s magical. This is actually the one time of year where I shelf my creativity and want only those traditional dishes and flavors that I wait for all year. As much as I’m all about cooking from scratch, I think everyone has at least one canned/boxed thanksgiving favorite that we grew up on. For some it’s the cranberry sauce that jiggles in the shape of the can. For others it’s the canned green beans, canned mushroom soup, and canned fried onions that combine to make that legendary casserole. 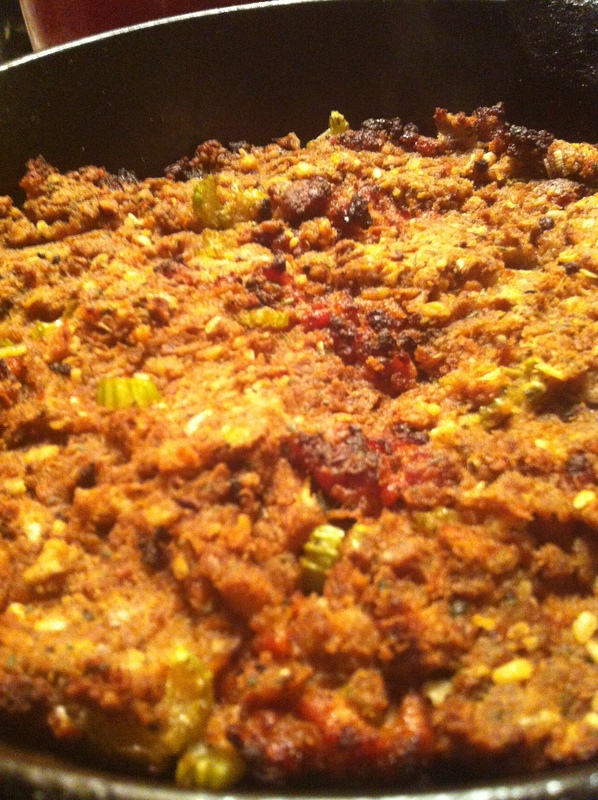 For the Volpe family, it’s boxed stuffing. Stove Top, to be exact. I can’t get to thanksgiving every year without thinking of my grandfather, whom we lovingly called Poppy. I cooked a lot with him when I was a kid. My dad still talks about the pizzas he and I used to make; super thick crust piled high with absurd amounts of cheese and fresh toppings. But Poppy wasn’t the kind of cook you might expect a grandparent to be. He proudly owned and regularly used not one but two microwave ovens. Thanksgiving, then, for him meant frozen mashed potatoes, canned corn, and of course, Stove Top stuffing. He would load it up with Jimmy Dean sausage, put it in a metal loaf pan and toss it in the oven with the turkey. One year he over did it… like, really over did it. 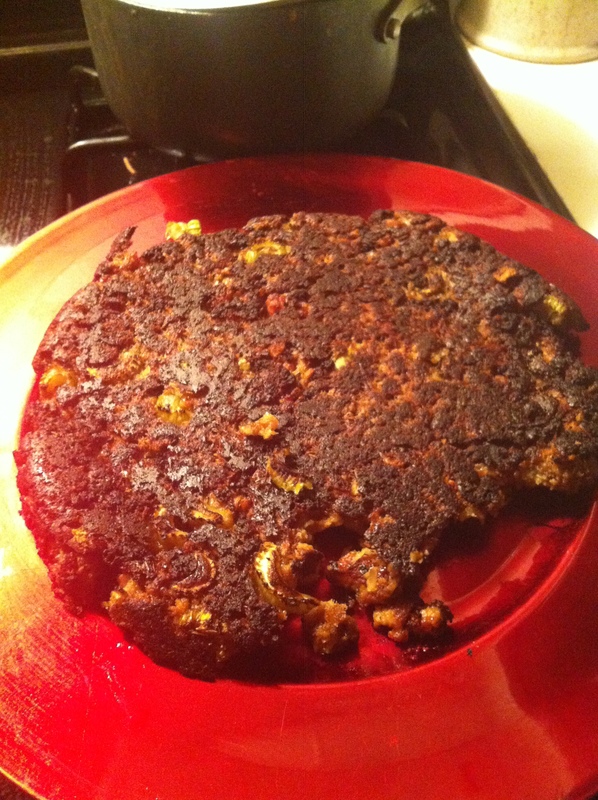 The stuffing fell out of the pan and thunked onto the plate as a dark cobbled brick. Without missing a beat, all of us began to pick at the almost alarmingly crunchy exterior that had formed while staying in the oven for that long. It was friggin delicious. And thus was born the tradition of burned stuffing. When asked how he makes such a creation, my grandfather’s response was always, “basically I just burn the hell out of it.” Gotta love him. Poppy has been gone now for some years and though we’ve tried, none of us have been quite able to replicate the magnitude of crunchy overcooked crust that he was somehow able to achieve. However, I have managed to create a version that comes pretty close and satisfied that yearly itch for some crunchy stuffing. Here’s how I do it. Preheat your oven to 425 degrees. Prepare 1 box of Stove Top stuffing according to the package directions (though I only use half the butter they call for, if not less). In an 8-inch cast iron skillet I brown two links of sweet italian sausage that I remove from the casings and break up into little bits. When they are just about done I add in one rib of chopped fresh celery and let it cook until it begins to soften. I then kill the heat, dump the stuffing into the skillet, mix thoroughly, and spread into an even layer. Place the skillet on the lowest rack of your oven and let cook for 15-20 minutes or until it has darkened considerably and the bottom has formed a lovely crust. The picture to the right is what it looks like when it has been flipped out of the pan. Delish. This has become a quiet tradition for me that I do at the beginning of thanksgiving week. I make it in my skillet and pick at it while I remember the days of all of us huddled around the counter at my grandfather’s house. My cousins and I would drink coke, eat stuffing, and effectively ruin our appetites before the meal even hit the table. Those were the days.